Great unit for small offices or workgroups. We have several and our offices love them. 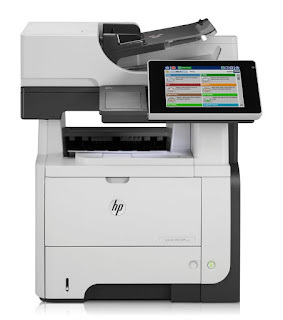 Also good in areas that are too far away from the central copier Also an HP laserjet MFP series such as the warehouse. The Scan to Email is a favorite feature, either to send the document to ourselves (and forward to a client) or for inter-office mail. The unit can use LDAP to look up e-mail addresses in Active Directory so you can just type a few letters of the name in the "To" field. The touch panel is easy to figure out and reasonably easy to customize from the web interface. Management from the web interface is good also. Has issues with scan to email quality, usually faded out unless you configure the contrast on the printer to fully dark. Also has issues working of the print server role on Server 2008r2. HP LaserJet 500 M525F is second one, UPS smashed the first one it was no trouble returning it there is no (guessing at the spelling) twayne scanning available on this HP LaserJet enterprise 500. In other words, you have to initiate the scan from the unit, not from the computer but it saves it to a file on your desktop. I'm surprised, a hundred dollar all in one unit will do that this was meant for a work group and I'm a single user so maybe there's some security reason that they have it that way. It's an extra step to what I'm used to but not a big deal. Very fast, very quiet, HP 4100 lasted 10 years with no repairs totally sold on HP M525F printers. A really nice addition to our tax office. We are really cramped for space and this machine replaces a copier, printer, and scanner. We really like the speed of copying and printing with virtually no long warm up times. Very easy to set up and use. This HP LaserJet 500 Printer is great. Filled with features, touch screen is really huge I wished it could staple but otherwise great printer. The large touch panel works really well (looks like HP found a use for their unsold tablets.